In my opinion there’s no other single varietal more satisfying than a Cabernet Franc done right. Admittedly they’re not done right very often, but this one sure is. 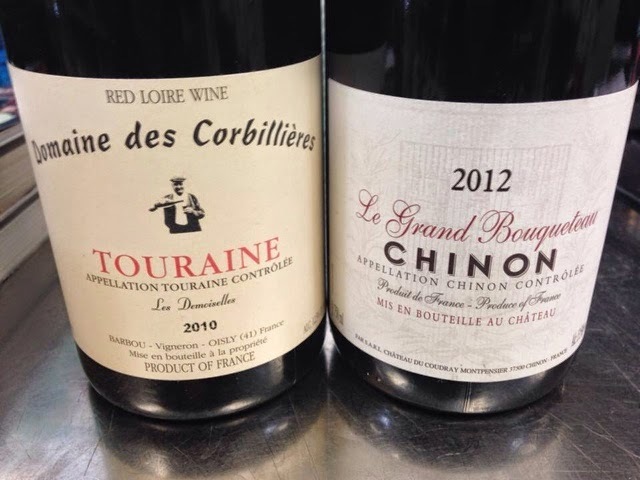 In France's Loire Valley there’s a commune called Chinon and Cabernet Franc, a parent of Cabernet Sauvignon, is pretty much what they do. The thing that fascinates me about Cabernet Franc is its aroma. I could just smell it all day, not have a single sip and be completely happy. Bouqueteau’s nose has violets, fresh tomato leaves, red bell pepper, ice-melt salt and beach sand. The palate has home-made cranberry sauce (that morphs into red plum as the wine opens up), green pepper, dried herbs and brown spices, with a cherry and vanilla cola finish. Its ingredient-like and seasoning-like character along with high acidity and round tannin make it compatible with a wide range of food from pasta with tomato sauce, to hearty steaks, to herb-rubbed chicken breasts, to camembert brie.